1. Winter Green Miso Noodle Soup – (101 Cookbooks) The noodle soup above is built on my green miso paste. Simply add water, whatever fresh noodles, and some winter greens, and you're good. 2. Pumpkin Miso Broth with Soba – (My New Roots) Perfect winter combination and colors. The combination of sesame seeds and sautéed shiitake mushrooms on top looks wonderful. 3. One-Pot 5-Spice Chickpea Noodle Soup – (Will Frolic for Food) A hearty soup made with rotini. It highlights an array of five spices along with a combination of balsamic, apple cider vinegar, and yogurt to create a rich stew-y soup. 4. 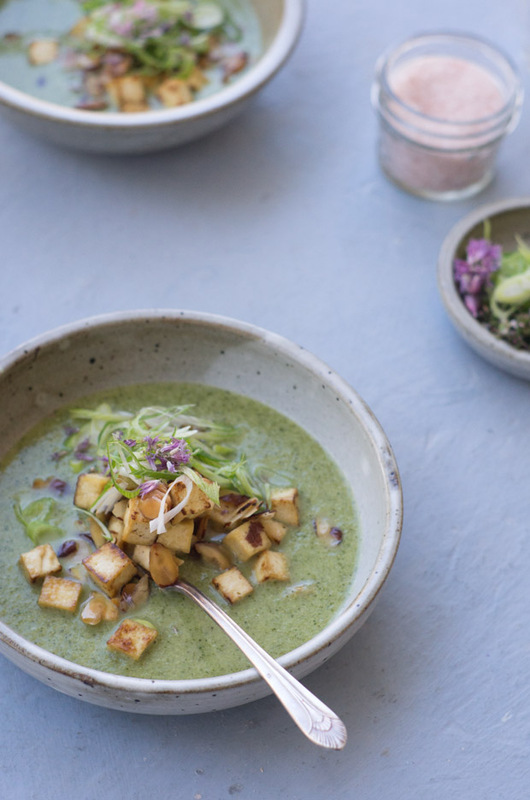 Shiitake and Spinach Miso Soup – (A Beautiful Plate / Love and Lemons ) Originally from the beautiful Love and Lemons cookbook, this recipe will inspire you to source some perfect shiitake mushrooms. Two cups of spinach means you'll get a healthy dose of greens. 5. 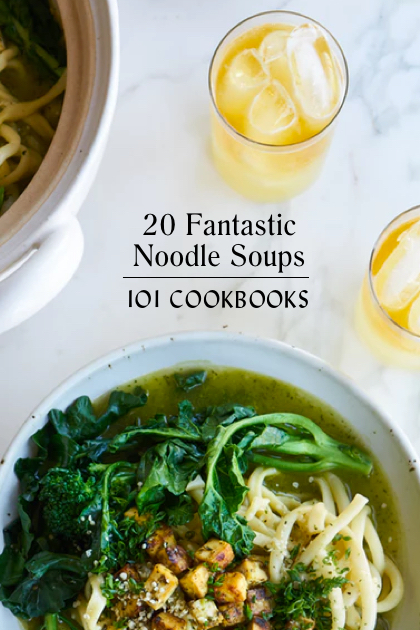 New Year Noodle Soup Recipe – (101 Cookbooks) This is an all-time favorite traditional Persian noodle soup. 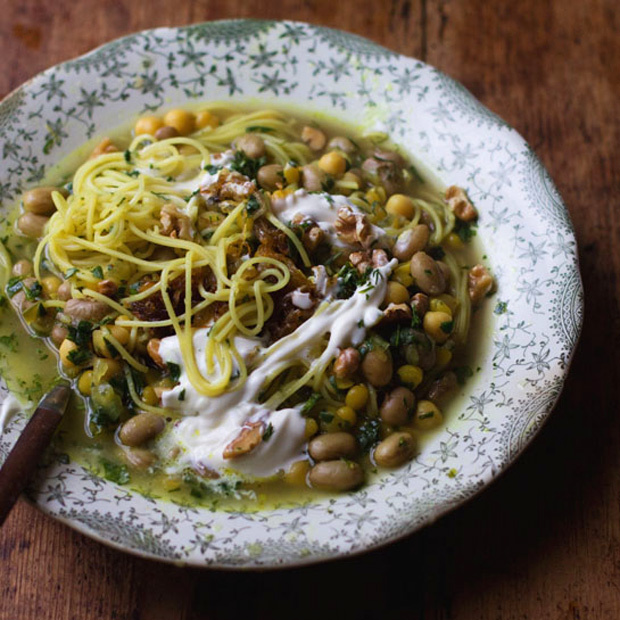 It features thin egg noodles, borlotti beans, herbs, turmeric, cumin, and all sorts of other ingredient magic. 6. Chickpea Noodle Soup with Parsley and Lemon – (Occasionally Eggs) Chickpeas, carrots, cayenne and a squeeze of lemon make this a good candidate for cold season. 7. Chickpea & Sweet Potato Noodle Soup – (My New Roots) This is one of those recipes that makes taking out the spiralizer worth it. 8. Kimchi and Buckwheat Noodle Egg drop soup – (Nyssa's Kitchen) For kimchi fans. This one is for you. Kimchi + Egg drop soup – you know it is going to be good. 9. Really Great Vegan Ramen – (101 Cookbooks) Here's my take on a vegan ramen. Bonus – all the components are great on their own (if you have leftovers), and there are seasonal ideas, for year round ramen. 10. Vegetarian Pho – (Happy Yolks / Green Kitchen Travels) An beautiful, inventive take on pho – bok choy, bean sprouts and basil with fennel. 11. Bangkok Coconut Curry Noodle bowls – (Pinch of Yum) Love the mix of colors in this one. Based on rice noodles and a mix of veggies, swap out the fish sauce for one of the veg versions out there and this is a hearty, straight-forward weekday meal. 12. Vegetarian Pho Noodle Soup – (Omnivore's Cookbook) Here's another pho, but a different technique is used to prep the ingredients. Deep smoky flavors are created by charring ginger and onions. 13. Vegetarian Ramen with Garlic-Ginger Broth – (The Roasted Root) All the greens, four or five different shades(!) layered on top of rice noodles. 14. Vegetarian Ramen Bowl with Spicy Brussels Sprouts – (Naturally Ella) A ramen bowl with a wild card – brussels sprouts roasted with sambal oelek. 15. Vegan Ramen Spicy Noodles – (Love is in My Tummy) Time to get your kombu on. 17. Mushroom and Spicy Tofu Udon Soup – (But First Plants) This is one you'll want to try if you can find some good, fresh udon noodles. Sriracha and sesame seeds provide a flavor twist. 18. Green Miso Soba Soup – (Fork Knife Swoon) This miso + soba combination uses a healthy dose of onion, ginger and garlic to provide a good clearing of the sinuses. 19. Ginger Miso Udon Noodles with Five-Spice Tofu – (Healthy Nibbles and Bits ) Here's another take on miso with ginger, but this time with udon. Ground coriander and a five-spice blend for the tofu offer unique flavors for a noodle soup. 20. Turmeric Miso Soup with Shiitakes, Turnips and Soba – (Lindsey Love) Here's a soba soup that uses fresh turmeric, yellow miso and the surprise: turnips. 21. Vegetable Miso Soup with Soba Noodles – (Marie Reginato) This is another miso soup recipe that creates a solid flavor base with kombu / kelp, so seek it out at the store (also easy to find online). Cabbage and sweet potato provide a winter veg base, but you could adapt this to different seasons. This is the sort of soup I crave when the weather turns. Hearty, substantial, and squarely in the comfort food realm. It's the simplest of bean soups, topped with plump herb-packed dumplings. I use whatever herbs I have on hand, and in this case it was dill, basil, and minced lemongrass, along with lots of scallions. Doubling down on the herb flavors, I also add a big dollop of pesto. A classic dumpling stew with a green, herby twist. Super delicious, and satisfying. I note a number of variations in the headnotes of the recipe down below. If you don't want to go the pesto route, a mustard-spike is also delicious. Or, harissa! A couple of tablespoons of harissa paste in place of pesto takes the dumplings in a completely different directions. Making this soup vegan is simple. The soup is already vegan, you just need to make a couple tweaks to the dumplings. First, be sure to use nut milk in the dumpling batter, and omit the egg (adding an extra 1/4 cup of nut milk to the batter). The details are in the headnotes as well. The dumplings are a bit more dense, but still tasty. The one important detail to adhere to – don't oversize the dumplings. 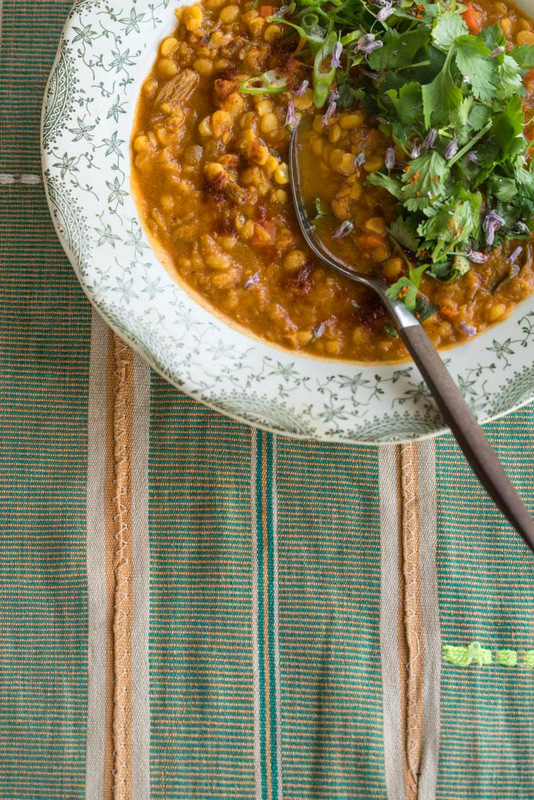 I've written so many lentil soup recipes for this site (and for my books), that I remember telling myself to take a break for a while. So, although I haven't published one in a while, I rarely go more than a week without making some sort of lentil soup goodness. Trying other lentil soups I come across is also a great way to expand my line-up, and brothy, creamy, chunky, pureed, spiced, and straight versions are all are fair game as far as I'm concerned. Here's a list of some tried-and-true favorites, and some great takes I've come across from out and about. Not technically lentil soup, but close enough. 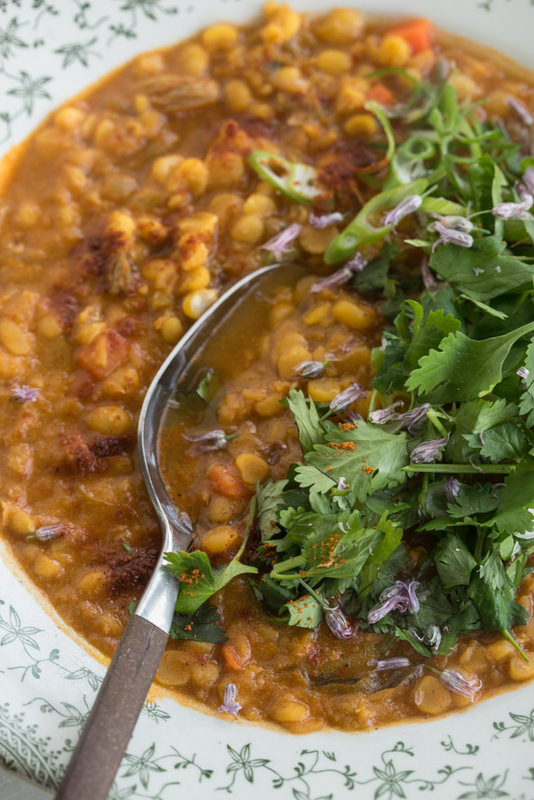 A ginger and curry-spiked yellow split pea stunner. Leftovers freeze well, and this makes an A+ lunch. Get the recipe here. One of the top ten best soups of my life. Get the recipe here. For the crockpot enthusiasts out there. Get the recipe here. 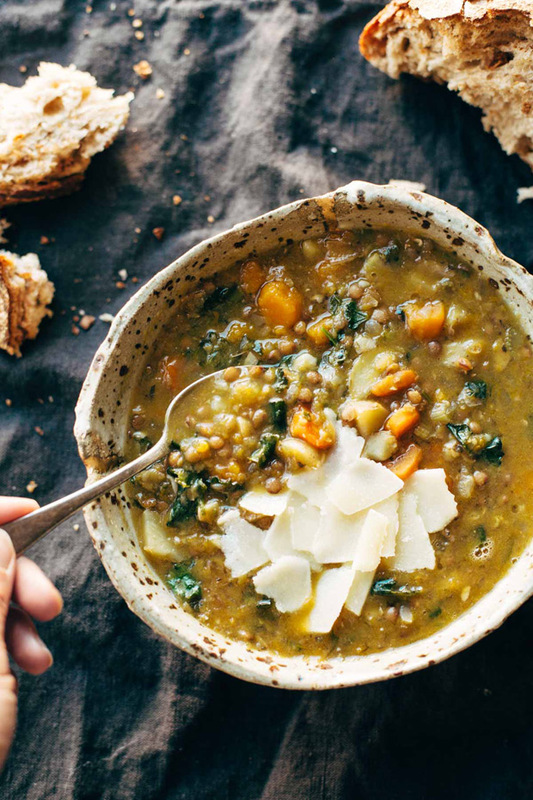 This is my favorite soup (yes, ever) and it has lentils in it, so I'm including it here. At its core we're talking about a bean and noodle soup featuring thin egg noodles swimming in a fragrant broth spiced with turmeric, cumin, chiles, and black pepper. 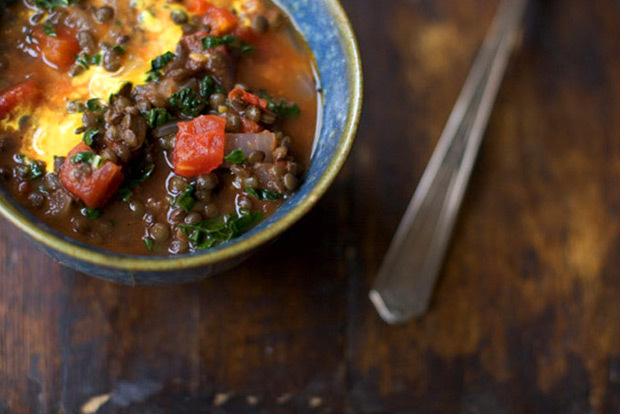 You use a medley of lentils, chickpeas, and borlotti beans, making the soup hearty and filling without being heavy. You add spinach, dill, and cilantro. You add lime juice for a bit of sour at the end. And then you've got a number of toppings to add when you serve the soup – chopped walnuts, caramelized onions, and sour cream. From deep in the 101 archives. Get the recipe here. 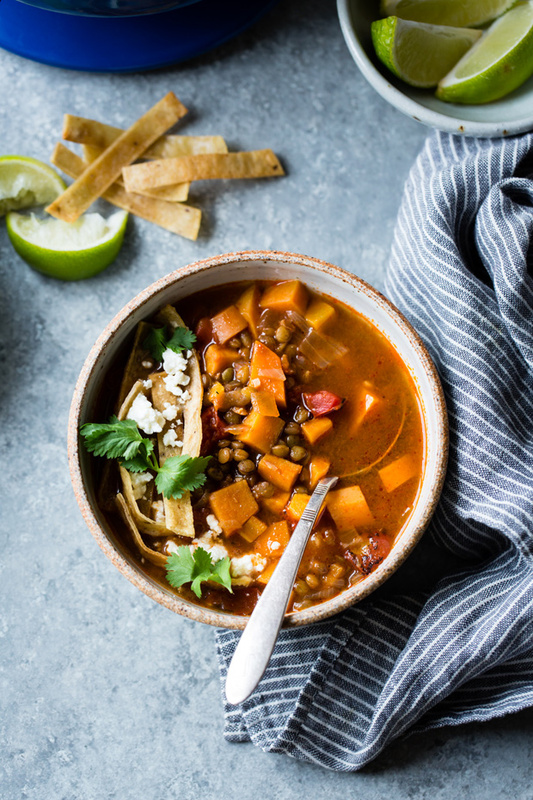 Lentil soup meets tortilla soup in brothy sweet potato-studded bowls of chipotle warmed goodness. More details here. Green lentils (or split peas), topped with a curried brown butter drizzle, and pan-fried paneer cubes. Get the recipe here. When you're ready to really raid your spice cupboard, this is the recipe. 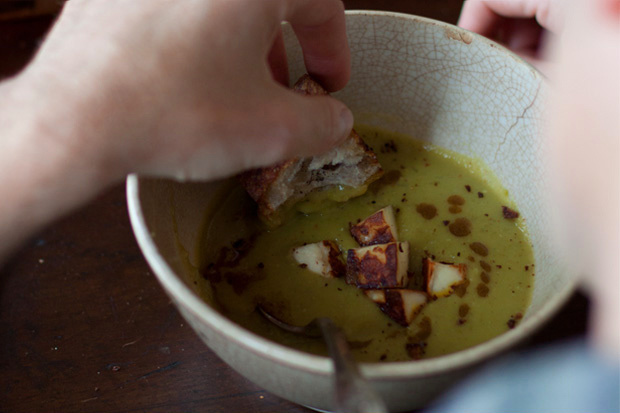 This is a recipe to turn to if you find yourself coming down with a cold anytime soon. Get the full recipe here. This is what I make when I need a bit of a reset. Make a big pot, and then eat throughout the week. Get the recipe here. This Chitra Agrawal recipe caught my attention because it cleverly incorporates coconut, but not coconut milk. 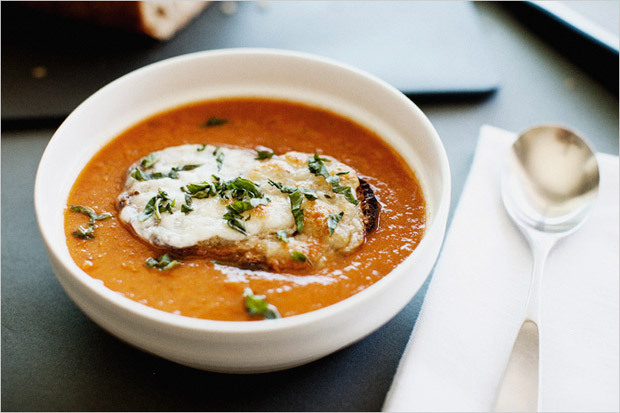 So, the broth stays hearty but not creamy – hits the spot when you want something filling but not overly decadent. Get the recipe here. Adding this at the last minute. Another slow cooker option. This one with a minestrone angle. 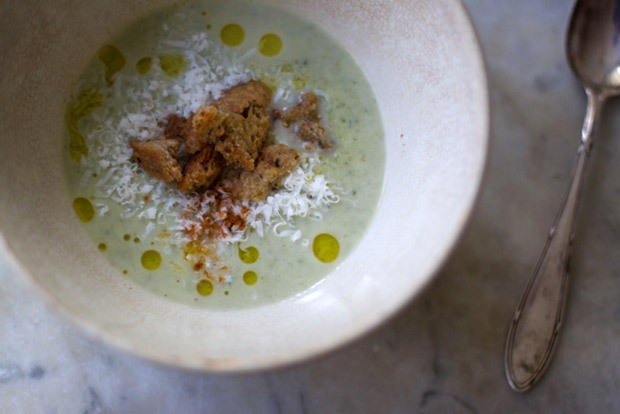 Blender soups are great because, often, you need just a few ingredients. Start with one all-star, seasonal ingredient like winter squash, broccoli, tomato, or asparagus. 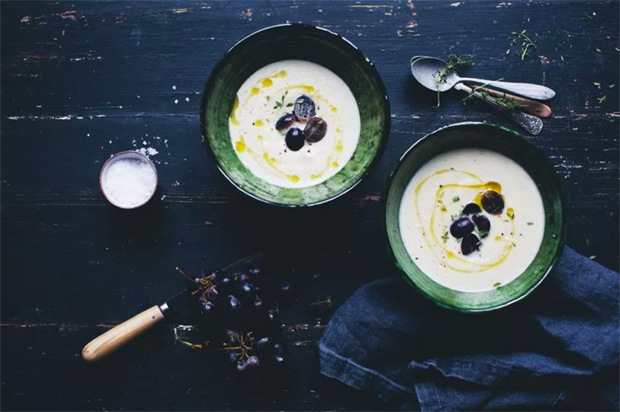 Beyond that, perhaps an onion, some broth or water, some herbs or spices, boom – you've got what you need to make a beautiful, silky blended soup. 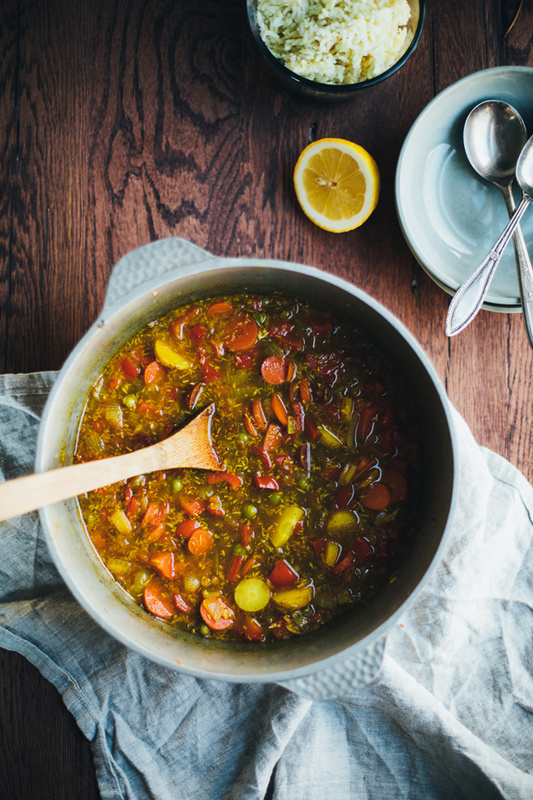 A soup like this can come together in under fifteen minutes – you cook the aromatics, add the main vegetable with some broth or favored liquid, and let simmer until the vegetable(s) are cooked through. Then you go to town with more spices and toppings. I throw the term blender around loosely here. If you don't have a traditional blender, a hand blender is fine. They work great, particularly if you're one of those people who avoids dealing with a blender because of the clean-up. 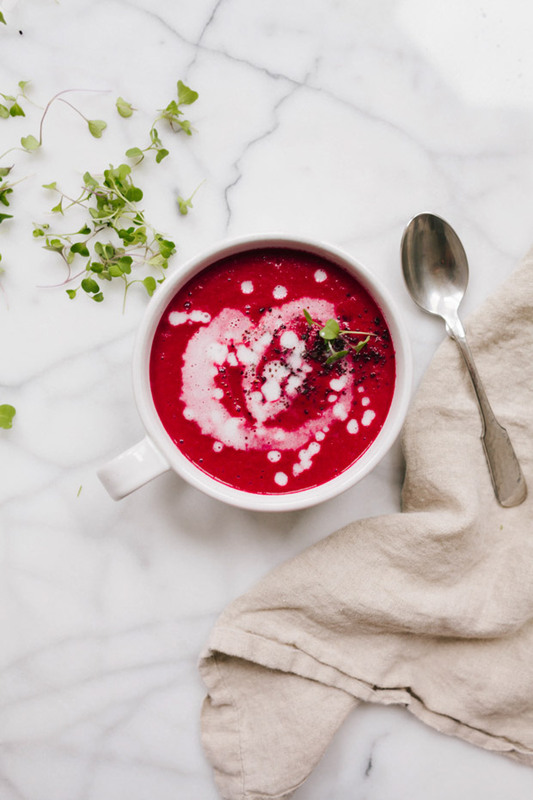 😉 A high-speed blender can give an extra smooth, beautiful texture, but I used an immersion hand blender for years, making soups like these, before taking the high-speed plunge. Still delicious. 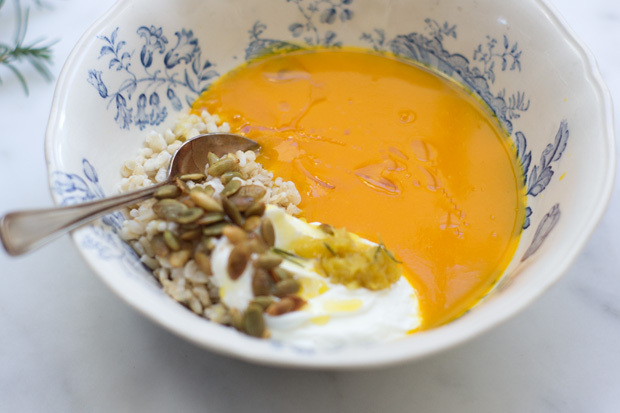 This simplest carrot soup! Carrots and onion form the base, it's spiked with dollop of red curry paste, and then pureed into silky oblivion. Get the recipe here. 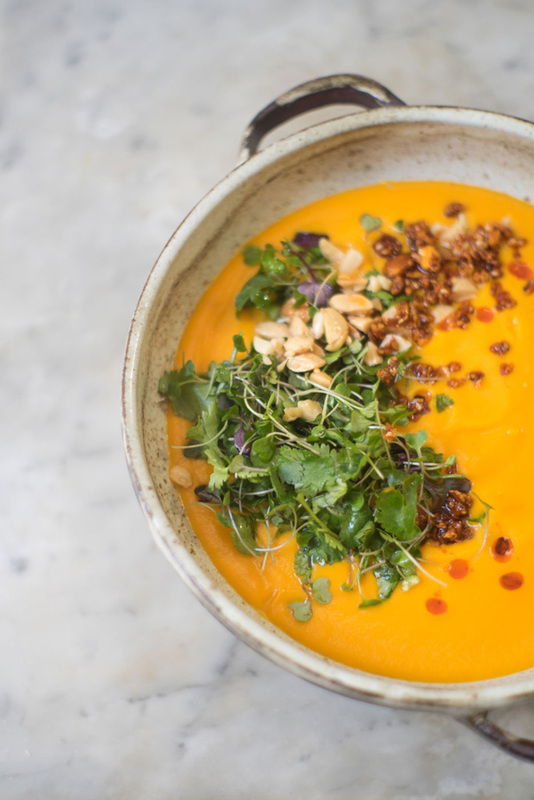 If you're up for a more complex carrot soup, here's where it's at. Lemongrass, coconut, ginger, garlic, and tahini come together in this beauty. it's a blended carrot soup with a coco-almond streusel topping. Right? Get the recipe here. 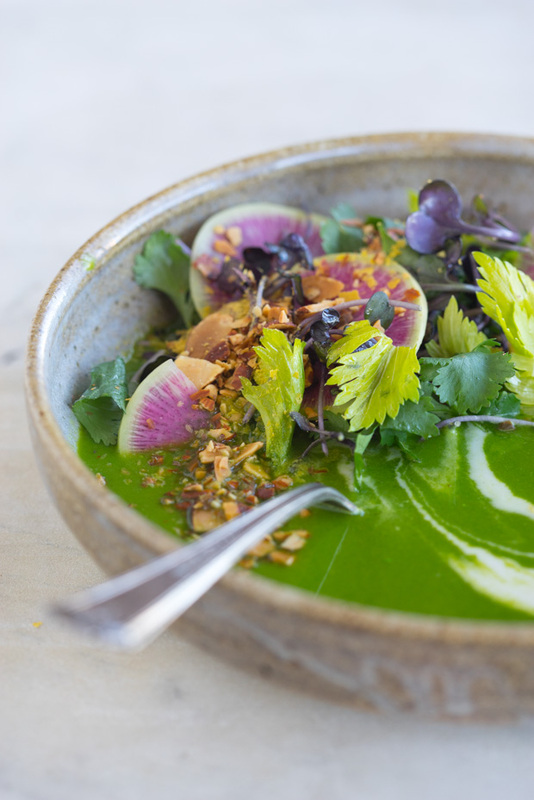 Ten ingredients in a blender, this soup is a potent jolt of alkalizing vegetables and herbs, made with a protein-rich split green pea base. This is great when you need an anti-dote to and overly indulgent week. Get the recipe here. With their abundant vitamins and minerals, I'm always looking for ways to work more nettles into my diet. 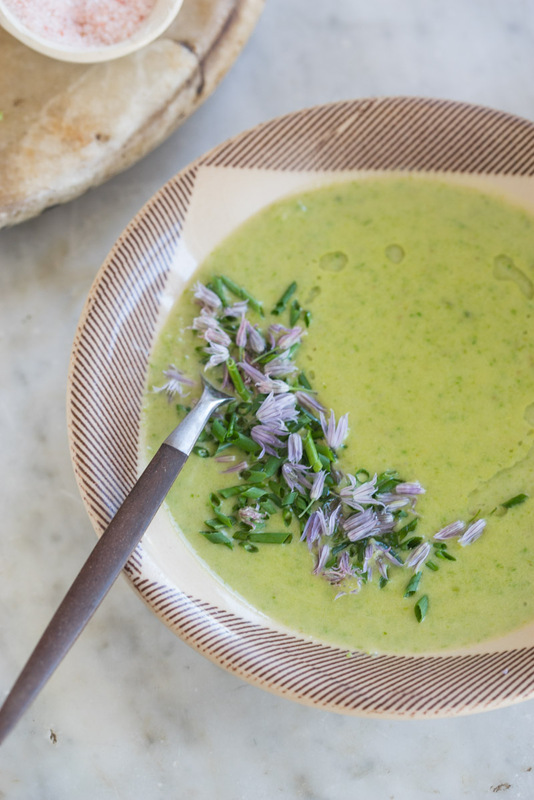 Andrea always inspires, and this is the perfect soup for springtime or if you come across nettles at the market (or out on a hike!). Use a veg broth if you'd like to keep it vegetarian / vegan. Get the recipe here. 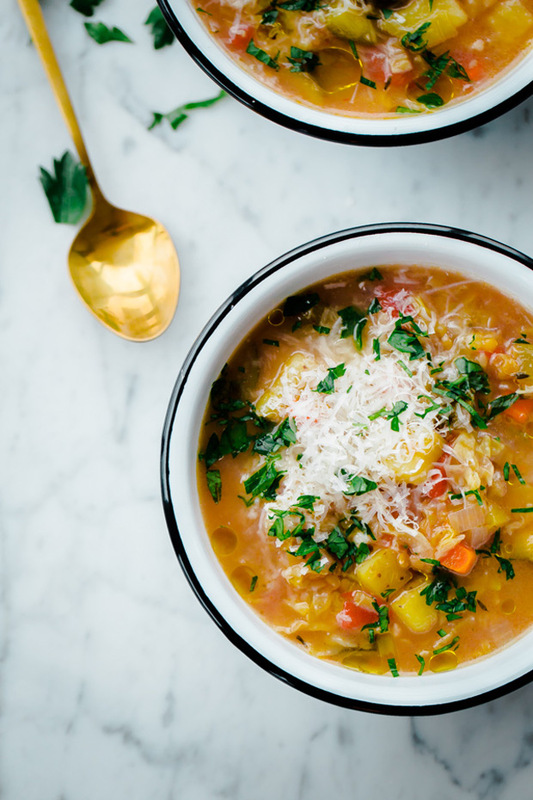 When you've had your fill of the seasons best fresh tomatoes, and when you're ready to transition into fall, this is the soup to make. You still want to use great tomatoes, and you can easily make this vegan by using coconut milk or a thick nut milk in place of the heavy cream called for. Get the recipe here. 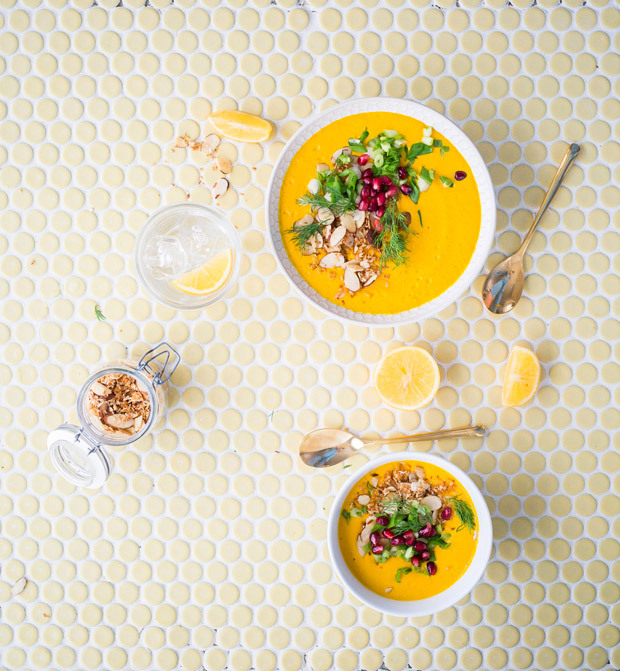 From Julie's Superfood Soups book, this vibrant blended stunner includes power ingredients like cumin, turmeric, and maca. It has a coconut milk base, nut milks will work as well. Get the recipe here. Sometimes simple is best, and that what you see here. A recipe by nutritionist Dana James strong on the cauliflower front, with a hint of lemon. Five ingredients (aside from water, salt). Get the recipe here. A (remote) riff on Spanish gazpacho. I love the use of underutilized parsnips here, and the red grape and thyme finish. Get the recipe here. I love the combination of broccoli, mustard, and Cheddar here. Get the recipe here. Brilliant use of smoked salt here adding depth to a winter squash and apple blended soup base. Also, an herby kiss of fresh time counters the natural sweetness here. To make this vegan, swap in your favorite non-dairy milk for the cream – a thick homemade cashew nut milk works great – (1 cup soaked nuts blended w/ two nuts, strained). Get the recipe here. A simple broccoli and spinach affair, made with coconut milk broth, double greens (broccoli & spinach), and topped with good stuff like pan-fried tofu cubes, lots of toasted almonds, and shredded scallions. Get the recipe here. Spiked with a dollop of green curry paste, this is a springtime favorite. Just a handful of ingredients, and you can use cashew nut or almond milk in place of the coconut milk if you like. Get the recipe here. Ginger-spiked pumpkin (or winter squash) soup. It calls for fresh ginger juice, pressed from grated ginger, and a kiss of serrano chile. Just a short list of ingredients come together beautifully here. Get the recipe here. I don’t use the term life changing lightly, but this rice porridge recipe fits the bill. 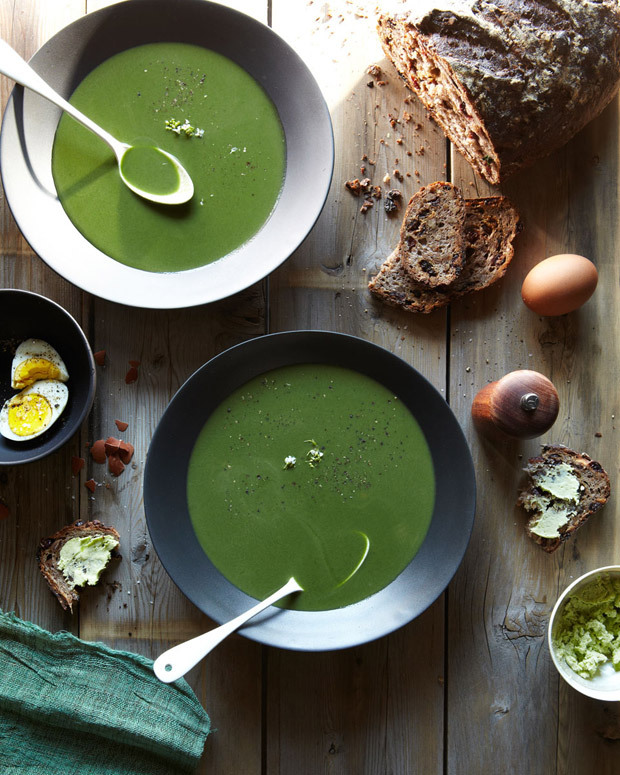 It’s a one pot, effortless, green, nutrient-packed twist on one of my favorite things to eat. Congee, also commonly referred to as rice porridge. This version incorporates a lot of chopped spinach. A lot. Enough spinach that your body will notice. I make this porridge in an Instant Pot. You can also make it in a thick-bottomed pot on the stovetop – no Instant Pot necessary. Although, that method requires more babysitting. 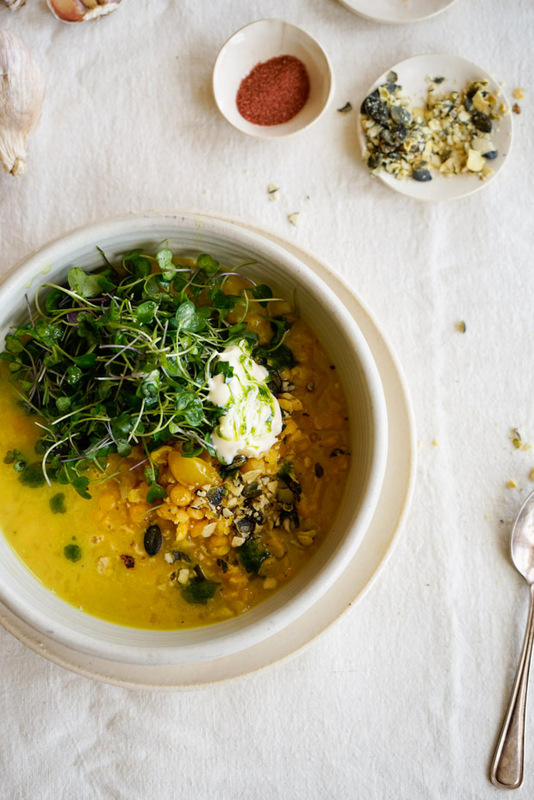 Similar to this Instant Pot Congee with Brown Rice and Turmeric, you put your rice into the pot, add water or broth, walk away, and start daydreaming about toppings. Here you see lime, crushed kale chips and toasted nori, toasted pepitas, hemp seeds, and jungle peanuts. The tofu is sliced thinly, drizzled with shoyu, and draped over the porridge. Sometimes I spike the whole situation with sriracha sauce, sometimes I don’t. I’ve settled on a ratio of brown rice to white rice that works really well. You’ll see that reflected in the recipe. It’s one part white jasmine rice to two parts brown jasmine rice. You can optionally pepper that rice blend with 1/4 cup of other quick cooking grains or pulses if you like – French lentils, adzuki beans, Job’s tears, etc. Or not, totally your call! I know I say this often, but feel free to use this recipe and ratio as a jumping off point. Next time I might add a bunch of chopped herbs, and use another favorite broth in place of water. I hope you love this rice porridge! It’s nutrient-packed and green. Simple to make. Made with whole foods. Delicious anytime of day. One pan magic. And, the perfect hearty, satisfying canvas to load up with your favorite toppings. Lastly, for anyone looking for more Instant Pot recipe inspiration, I've set up an Instant Pot recipe category – all my favorite successes are featured there. And, for reference, this is the Instant Pot I used for this recipe: Instant Pot DUO Plus 6 Qt 9-in-1Enjoy! 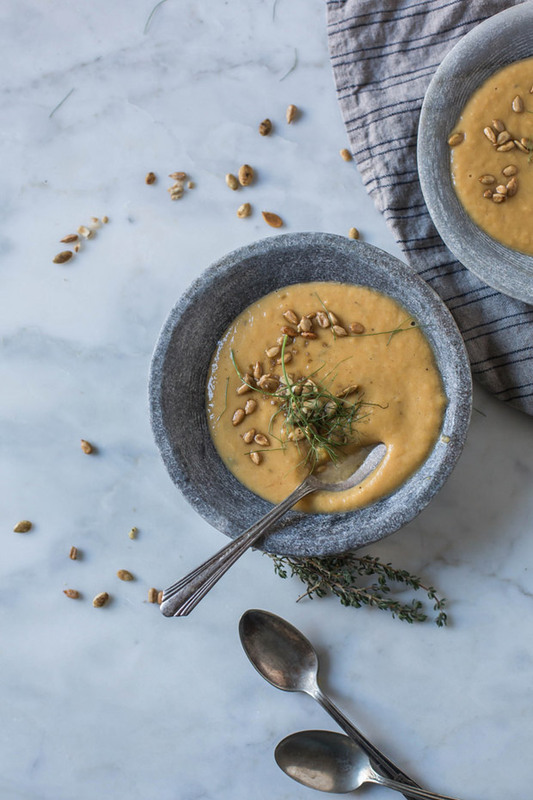 If you're looking to make a silky smooth, creamy vegan soup, today is your day. This gem caught my attention because it is quite different than most “creamy” vegan soups I come across. It uses a clever trick to achieve its signature texture. And the resulting soup doesn't rely on heavy cream or lots of coconut milk. Bingo. The lineage of this soup goes something like this. Genius recipe-spotter Kristen Miglore highlighted this Paul Bertolli recipe on Food52 back in 2011. The CAP Beauty ladies gave it a turmeric and mustard twist in their new book, and I went from there. Adding yellow split peas on top make it a one-bowl meal, nutritional yeast tees up some cheesy flavor notes. I also upped the quantity because, leftovers. The base of this soup is cauliflower. I make cauliflower soup all the time. The thing that makes this recipe special is the cooking technique. You let the cauliflower steam, in the pot, for 15 minutes. You can do this with cauliflower and get tender delicious florets out of the process. When you do this with vegetables like asparagus you end up with sad, overcooked, off color asparagus. Long way of saying, cauliflower is a great ingredient for this technique. Carrot and sweet potato also love the steam approach. This is a vegan soup. 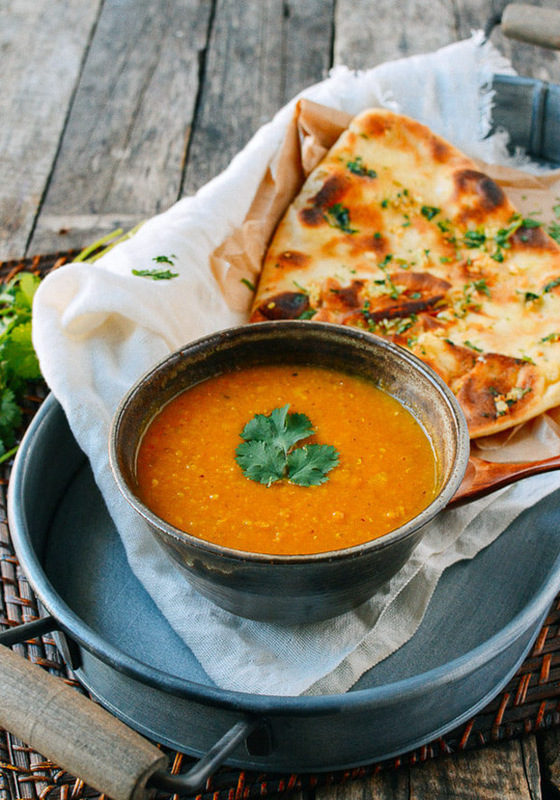 It is also gluten-free, boosted with turmeric, and relatively quick to make on a weeknight. Leftovers are great and endlessly adaptable. 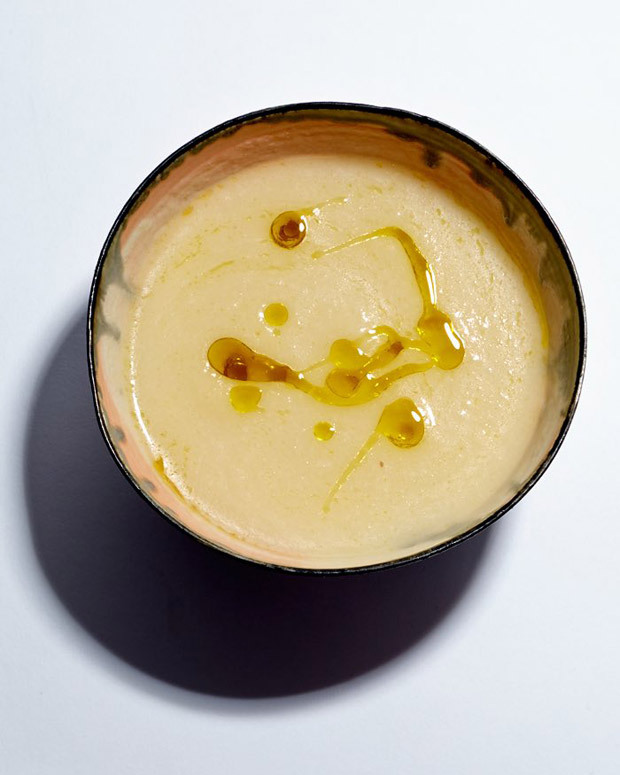 This version is spike with turmeric and mustard. You can certainly explore other directions. Grated ginger would be a great addition. Or, if you have spices left over from chana masala, perfect! I even stir a cup of rice porridge into the leftovers, for an excellent rice soup.